Come on Gig!!!!!! You can do better than that!!!!!!! 2nd row from the right: Pauline Pappas, Helen Papagelis, Joanne Pappas, Joanne Varvitsiotis, Joanne Papagelis, Diana Karthas (not from Vassara, a friend of mine from Newton). 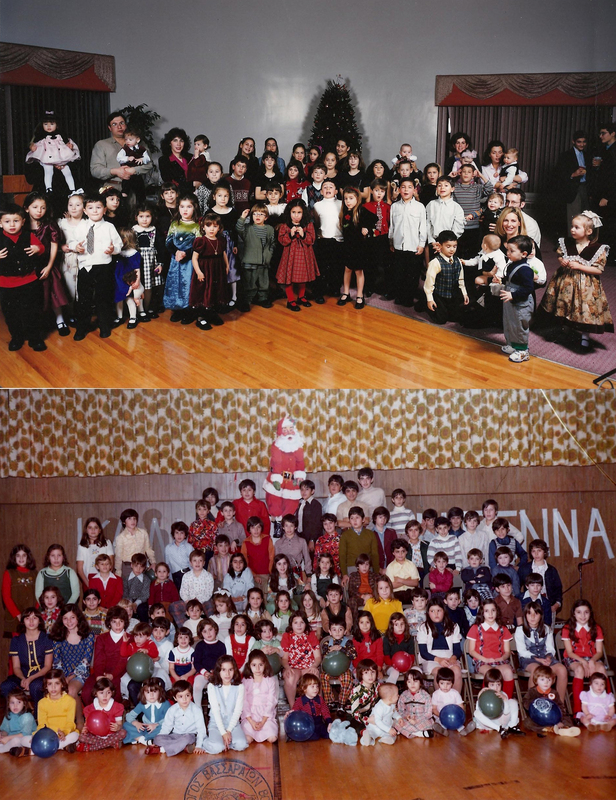 5th row from the left: Marina Psalidas, Nick Trongos, Peter Tongos, Nick Varvitsiotis. The boys wearing the white-striped shirts are my cousins George and Stephan Coufos, the boys wearing the red and black printed shirts are John and Kosta Lolos, the dude wearing the blue jacket, standing next to the microphone is my cousin George (Tasos) Koufos. In the last row is Steven Dakoyianis, Peter(Disco) Stavropoulos, and Peter (Spiros) Stavropoulos. Last but not least, the little boy in the 4th row wearing a groovy brown suit and orangy shirt is my partner in crime Paul (Paully Waully) Katsikaris!!! !